O'okiep Mine was surveyed in March 1856, and by 1862 was managed by John Taylor & Sons of London. They formed the Cape Copper Company, and by 1874 the mine was described by a correspondent in the Mining Journal as "the richest copper mine in the world". Photo: 22 Sept 2003 courtesy Errol Swanepoel. This "mountain engine", C.C.C. locomotive no 5, originally was Kitson works no T258/3486 built in 1891. It was later reboilered using C.C.C. no 7's boiler (built in 1898), and thus has a boiler back plate Kitson (T)287 / 9.4.1898, which you can see, when you visit. First visit to "Clara" was done on 22 September 2003. 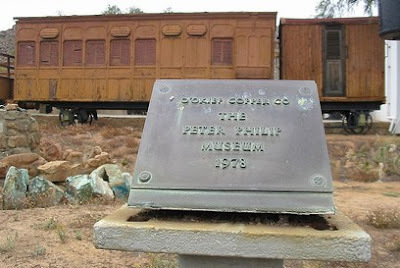 You can see this train displayed at the Peter Philip Mine Museum in Nababeep. The driver next to the loco is Brian, a visitor from Australia. 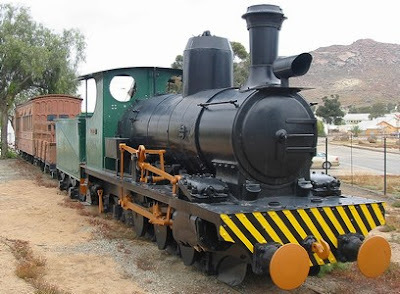 National monument "Clara" is the last of the Kitson type mountain locomotives used by the Cape Copper Company to transport copper ore from Okiep to Port Nolloth for export. If you look closely at the photo above, you can see the lids on the sandboxes for these mountain engines - on the front on both sides just under the smokebox door. Photo: 22 Sept 2003 courtesy Errol Swanepoel. Note that the loco is in want of some paint to keep it looking at its best. "Clara" was built by Kitson & Co., Airedale Foundry, Leeds, England. narrow gauge 2ft. 6in. It was built in 1891, and is a 42,5 ton design with 14in. diameter cylinders x 21in. stroke. 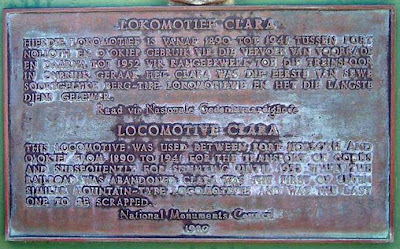 Clara first worked on the Port Nolloth Railway and later at the Cape Copper Company. Photo: 26 Sept 2005 courtesy Errol Swanepoel. - John Middleton pointed out to me that one can identify the lids of the sandboxes on this mountain loco - these are located on both sides just under the smokebox door. The second visit to Clara was done two years later on 26 September 2005. The museum compound was closed, and pictures could only be taken from the fence. Photo: 26 Sept 2005 courtesy Errol Swanepoel. With a new layer of paint Clara was in good shape again. Information on Clara is a bit scarce. She has been declared a national monument. On the outside the driver cab carries the letters OCC (Okiep Copper Co.). 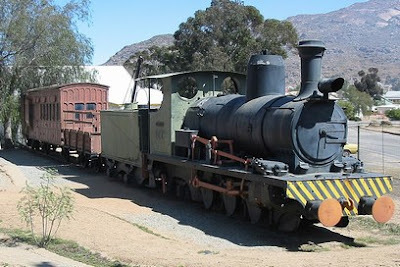 A narrow gauge railway to serve the copper mines from Port Nolloth was started in 1876 and lasted for 68 years, carrying ore to Port Nolloth and returning with equipment and provisions. Initially the carriages were drawn by animals, steam power only came much later. Clara was the last survivor when the line was closed in 1945. April 1994 - my own attempt on slide film to have a photo of Clara. A history of Copper Mining in Namaqualand - By Johan M Smalberger - Struik, 1975. Early Railways at the Cape - Jose Burman- Human & Rousseau, 1984. 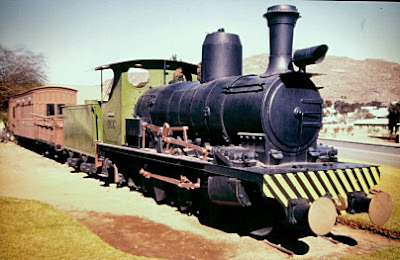 Industrial Locomotives of South Africa 1991 - J Middleton & H Williams. 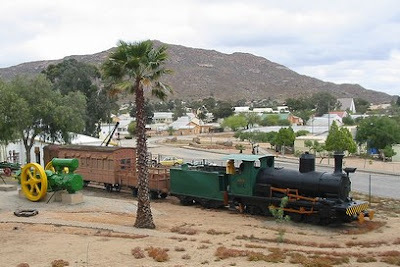 "The Little Railway in Namaqualand" - published in the Cape Monthly Magazine of April 1871 - Account written by Thomas Hall - also recently (2008) republished in "Life & Travels in the Northwest 1850-1899 - Namaqualand, Bushmanland & West Coast" - By Arne Schaefer, Tony Grogan -published by Life&Travels in the Northwes, 2008. 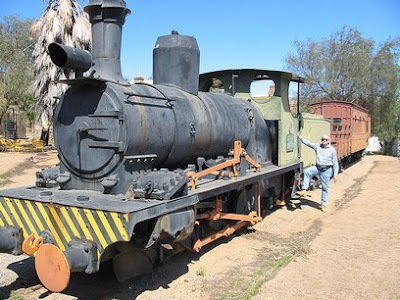 Mine heritage preserved under African skies - article here. Extract of an article written from a Cornish perspective by Liz Broekmann in the Spring 2008 Edition of the London Cornish Newsletter (pdf here). Thank you for a most informative article. I've added a link to it at the trivago community of which I am a member. Perhaps you would like to also submit a review or add some pictures?